On the edge of the tiny town of Kanarraville in Southern Utah, there’s an amazing slot canyon hike on Kanarra Creek. 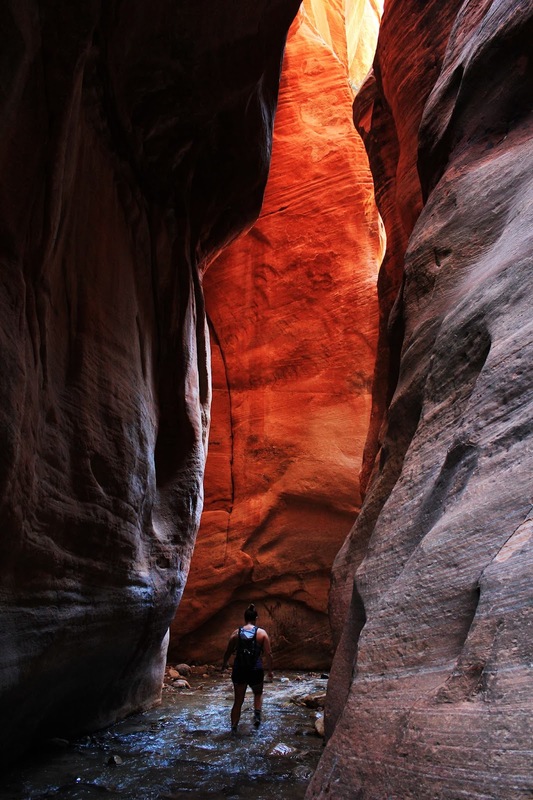 This hike is only an hour drive from Zion National Park. Kanarra Creek features several small waterfalls that you can actually climb using ladders and ropes. 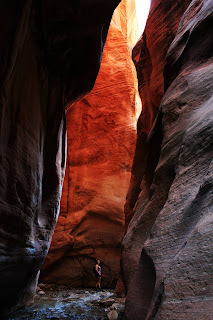 At its thinnest point, the slot canyon narrows to barely 8 feet wide. As you head upstream, the walls tower above you, providing a good amount of shade from the sun. The red canyon walls and pristine water makes this a popular destination for photographers. I saw more camera equipment on this hike than on any trail in recent memory and for good reason. Be warned, a good portion of the hike involves sloshing through the creek, so count on getting wet. I wore a pair of neoprene socks and my feet were fairly comfortable for most of the hike. In the summer, this hike can get extremely hot. It can rain and potentially flash flood in the spring, so the best time to do it is probably in the fall when the temperatures are mild. We did this hike midweek in May and it was a little crowded, possibly due to its close proximity to Zion National Park. We waited in a 20 minute line behind ten other hikers waiting to climb the wooden ladder at the final waterfall. Then we hiked for another 45 minutes upstream just to do a little exploring. From this point, we only passed two other hikers, so I assume most people just hike to the falls. The canyon walls in the upper part of the canyon must have been several hundred feet tall. We found a secluded spot by the river, ate lunch, and turned around to hike back to our car. We finished the hike in a little under 3 hours. This creek is used as a water source for the town, so make sure to pack out your trash and waste to avoid contaminating it. From the I-15 in Hurricane Utah, Head North for approximately 20 Miles. Take the Old Us 91 exit and drive North for 4 miles. In the town of Kanarraville, turn right onto E 100 N Street. Continue heading East until you reach the parking area for Kanarra Creek. The hike starts on a dirt road up a relatively tough climb to the water tower overlooking town. From the top, you head downhill into the canyon and hike upstream. Bring at least 15$ in cash to pay the parking fees. They raise the fee every other week, so its hard to keep track of what they’re charging. The police in town are apparently very eager to distribute parking tickets, so make sure you pony up the parking fee.